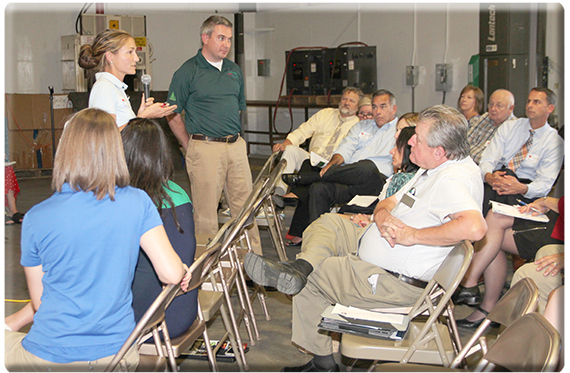 LOUISVILLE, Ky. – Agriculture Commissioner Ryan Quarles led a meeting of advocates for the hungry and local leaders to learn what is being done at the local level to combat food insecurity in the Louisville area Tuesday at the Dare to Care Food Bank on Fern Valley Road. Dare to Care reported that 156,570 food-insecure individuals live in the eight Kentucky counties that it serves. Dare to Care distributed 14.2 million meals to Kentucky clients in its most recent fiscal year, including 70,000 backpacks of food to 1,760 students in 29 Kentucky schools and 260,000 hot Kids Café meals. Map the Meal Gap, an annual study by Feeding America, found that 17 percent of the population of Kentucky – or 1 out of every 6 Kentuckians – is food insecure. The Hunger Task Force is part of the Kentucky Department of Agriculture’s Hunger Initiative, a first-of-its-kind effort to alleviate food insecurity in Kentucky. The objectives of the Hunger Task Force are to study the sources of hunger, identify the unique issues that affect different regions of the Commonwealth, and take an inventory of resources that can be brought to bear against the hunger problem in Kentucky. The task force is holding a series of regional meetings throughout the state to hear from volunteers fighting hunger at the local level. Meetings are scheduled for Sept. 19 in Elizabethtown and Sept. 28 in Pikeville. For more information about the Hunger Initiative and the Hunger Task Force, visit kyagr.com/hunger.